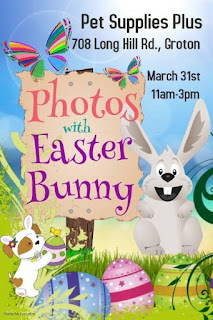 ...because Lisa will be dressing up as the Easter Bunny and I'll be taking photos and providing fresh-baked treats for the humans and pups. It's going to be a fun day. We are counting down the days. And, we get to spend this time with people who we love and adore! This is a fundraising event put on by Ledyard C.H.A.I.N. Photos will be $10 each. The money raised from this event will go towards the Raising The Roof Campaign. The Ledyard Pound needs a new roof. It's going to cost 10 grand. The goal is to reach this amount by September of this year. The Ledyard Pound has a special place in our hearts. Between our favorite humans who live upstairs and us downstairs, we have 4 rescue animals from the Ledyard Pound. One of which is a foster kitten from the litter we fostered a few years ago. In addition, Cindy and Jeff from Ledyard C.H.A.I.N. have always been generous with donating toys, treats, leashes, collars, apparel, and more to fill our Bodacious Care Packages for pet parents in need. They give SO much to their community and beyond. We are truly honored to assist with this fundraising event. And, we are looking forward to participating in the Ledyard Animal Control Appreciation Day on April 14th.